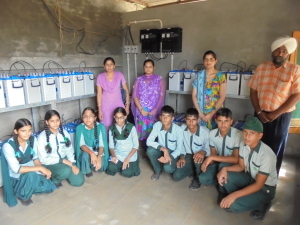 The Gilly Mundy Memorial Community School (GMMCS) has taken another step towards greater environmental sustainability thanks to the installation of solar cells on the school’s roof that was paid for by a generous donation from the UK. GMMCS has been previously reliant on an oil-powered generator because of the irregularity of the local electricity supply. The Solar Cell system is expected to deliver 90-100 units of electricity per day in summer, and 80 units approx in the winter. During the daytime and evening hours, the batteries provide enough to run the ceiling fans, computers and all other electrical appliances. What has been most noticeable is the lack of noise and smell that was an unfortunate by product of the daily use of the oil generator. The school environs are better for both students and staff. The savings in annual fuel costs will be channeled back into improving education at the school. The solar photovoltaic cell system was paid for with a donation from the Alty family in memory of Dr Christopher Alty (the husband of BKIT trustee Janet Alty). ‘When Christopher Alty (1935 – 1979) married Janet in July 1962 he was just embarking on his doctorate in nuclear engineering at Cambridge University. At the end of those three years, and having gained his PhD, he was appointed Lecturer in Thermodynamics and Fluids in the Engineering Department at the newly established University of Warwick. However he turned his back on research into nuclear fusion as he believed that it would be at least 40 years before delivering any electricity: it seems that even in 2014 it still is 40 years from anticipated delivery. In 1974 he read about the opening of the Centre for Alternative Technology in Wales (http://www.cat.org.uk) and said “We’re going there!” We first visited in 1975 then spent the summer of 1976 at “The Quarry” with our two children James, then 12, and Ali then 10. Christopher returned for a sabbatical term the following year. In 1977 an Inquiry was held into the then named Windscale Nuclear Power station: the Irish government alleged it was leaking radiation into the Irish Sea. The Technical Director of CAT, Robert Todd, saw this as an opportunity to present the alternatives to nuclear and he and Christopher worked for several weeks editing what became known as ‘An Alternative Energy Strategy for the United Kingdom’, bringing together wind, wave, solar and geothermal experts as well as those looking at the social impact of energy on the population, and the need for conservation of energy. The text was typed by Janet, on a borrowed electric typewriter, before the days of word processing! It remained in print for several editions and was only rewritten as Zero Carbon Britain 30 years later. In 1978/9 he was instrumental in establishing the first and only undergraduate course in non-nuclear engineering at Warwick University. It was entitled “Engineering Design for Appropriate Technology”, (always known as EDAT) many of whose graduates still populate the world of non-nuclear engineering. His Professor came to his bedside as he lay dying in February 1979 to give him the news that the course had been accepted by the Warwick University Senate. When Janet started visiting Haryana in 2005 she was amazed by the amount of unharnessed energy coming from the sun. 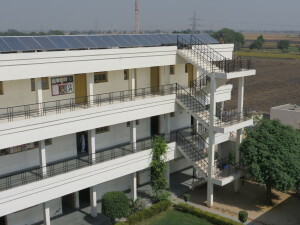 It’s taken a while, but in August 2014 an array of solar cells was erected on the roof of the Gilly Mundy School. The funds for these have been provided by the Alty family in memory of a loving husband and father who had dedicated his life to encouraging the growth of non-nuclear based energy sources’. Already there are low watt lights burning during the evening making the school look really bright and cheerful from the road. The next plan is to put LED lights down the drive and around the school wherever appropriate. It would have been nice to share our solar facility with nearby houses or the community in Lehrian, but to do that would have required an installation twice as big as the one we have. We can only hope that the GMMCS Solar Cell system inspires others to undertake their own solar installation.